We’d love your help. Let us know what’s wrong with this preview of UnGuarded by Ashley Robertson. Guardian angel Selene was so close to becoming an archangel—the supreme of all beings—until she fell in love with Cole, a forbidden dark one. Once she discovers her vampire lover has been kidnapped and the only way to save him is by abandoning her number one priority—Caitlyn, her human charge—there really is only one answer in Selene’s mind, even though leaving Caitlyn ung Guardian angel Selene was so close to becoming an archangel—the supreme of all beings—until she fell in love with Cole, a forbidden dark one. Once she discovers her vampire lover has been kidnapped and the only way to save him is by abandoning her number one priority—Caitlyn, her human charge—there really is only one answer in Selene’s mind, even though leaving Caitlyn unguarded will most likely cause Selene to fall from grace. To ask other readers questions about UnGuarded, please sign up. I liked that even though Selene was confused about how she felt for Luke, in the end she did make up her mind. Angel/Guardian powers (their extent or lack of it) are never explained-at one instance Selene just weaves "protection" while masking the vampires' presence. We were never told before that she could do that. Selene's behavior is similar too-she never thinks of the consequences before jumping into any situation. Shouldn't she know better? And Beck was right, why was she given so much leeway? Raphael knows what Selene's like but he never shares info with her- again seemed at odds with a wise Archangel. The battle with Limos was almost anti climatic. After Selene had become an immortal,the story felt like it dragged on. Oh my goodness, Ashley Robertson really starts this story off with a kick! Immediately we are thrown right into the action, with flashbacks, angels, demons, and vampires! 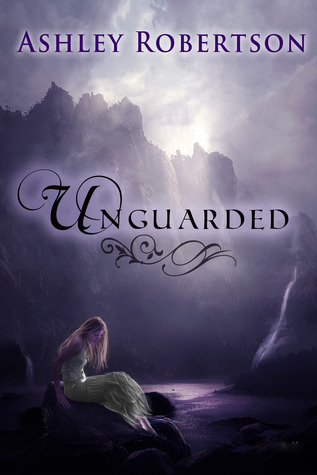 UnGuarded was my first book about angels and I absolutely adored it. I loved learning about the angel hierarchy, their duties, and their enemies. Selene, an angel, is distraught because her vampire lover Cole has been kidnapped, and it's her fault. Now she has to make a choice: she can abandon all hopes of rescuing Cole, or she can give up her human charge in exchange for information on how to find him. What does she put first: her duty as an angel, or her love for a vampire? This book reminded me of those questions that get posted online like, "Would you hurt someone to save your lover?" Those are the kinds of things you think about, but never actually expect to happen. But in UnGuarded, it does happen, and Selene has to make that decision. If I betrayed Caitlyn for just an hour, Moros would help me save Cole. [...] Was it worth Cole's undead life to give my human charge over to the monsters? [...] Everyone has a choice. After a few grueling moments, I'd made mine. This book is filled with so much raw emotion that had me getting teary at times. I really sympathized with Selene's position and struggled with her as she made her choices. I could completely understand where she was coming from: she had a strong desire to save her lover, but she also didn't want to throw her human charge to the demons. Not only is she responsible for her charge—Caitlyn—but she also has a friendship and a bond with her. She's basically forced to choose which one will be hurt (or worse). It's really heartbreaking to see Selene go through this struggle and deal with the pain and guilt, and meanwhile, her status as an angel is also at risk. She was so close to becoming an archangel, but ever since she fell in love with a vampire—a creature of darkness—her reputation and powers have been on the decline. And now that she's neglecting her duties as Caitlyn's charge, she's seriously risking becoming a fallen angel. At first, most of what we know about Cole is through a series of flashbacks. We never actually meet Cole until much later in the book. At first it was difficult to relate to and understand Selene's love for Cole when we never actually met him, but as the memories and flashbacks became more frequent, I began to understand. Their love is forbidden, but beautiful at the same time. They truly care for each other and are willing to risk life itself. UnGuarded does have a love triangle, but it's done in such a way that I have no idea who to root for. We get to know Cole through the flashbacks, but that's it (until the end of the book). Then there's Luke. Luke is helping Selene rescue Cole. So I was wanting to root for Cole since he's the one Selene already loves, but I found it hard to stay loyal to him when I never actually 'met' him! So part of me wanted Selene to remain loyal to Cole, but then Luke was there in all his sexiness, stealing the spotlight! I think finally I did decide that I'm a Cole fan because Luke has more of the bad boy vibe and that's usually not the kind of guy I like! UnGuarded is an wonderful love story. It is like West Side Story meets Dracula. The story revolves around Selene, an Angel and Cole, a Vampire. They are in love. Angels and Vampires are banned from interacting. Angels are from “the good side” while Vampires are from “the bad side ”. Yet here we have Selene and Cole defying all odds and falling in love. Selene is told by her Archangel Raphael to stay away from Cole. She is at risk of Falling and loosing everything. This is only the tip of the ice UnGuarded is an wonderful love story. It is like West Side Story meets Dracula. The story revolves around Selene, an Angel and Cole, a Vampire. They are in love. Angels and Vampires are banned from interacting. Angels are from “the good side” while Vampires are from “the bad side ”. Yet here we have Selene and Cole defying all odds and falling in love. Selene is told by her Archangel Raphael to stay away from Cole. She is at risk of Falling and loosing everything. This is only the tip of the iceberg when it come to the things that Selene and Cole have to deal with. When Cole is kidnapped by a demon, Selene risks all to get him back. That includes risking the life of her human charge Caitlyn and being blood bound to Vampire Luke. Selene saves Cole but they have to fight to keep the relationship together at the same time Selene is fighting her growing feelings for Luke. Cole is home safe and sound, now Selene has to focus on Caitlyn. Her time is running out and Selene is the only one who can save her. In saving her and herself everything goes awry. In the end Selene finds herself not quite Fallen and with the one she loves. Mrs. Robertson did an awesome job of having different paranormal worlds collide and flow so wonderfully. This story is full of action, love, a little mystery and some good old drama with a love triangle. This story has dimension ad doesn't fall flat. Everything works well together to keep you entertained from beginning to end. I like the fact that the author puts good and evil as allies. They fight together to rid the world of a common enemy. You see enemies working together all the time but I think I like it more because they are Angels, demons and Vampires. They are the pinnacle of Good and Evil. I have to say my favorite character is Luke. I have a soft spot for the bad boys. I think that he means well when it comes to Selene but he does play dirty to get close to her. You have to admit though he never would have gotten as far as he did with her if she didn’t have some sort of feelings for him. UnGuarded, I will say, has potential. The plot is intriguing, the drama is thick and runs through the entire novel, and the writing is well done. I also very much enjoyed the chemistry between Luke and Selene; when it was the two of them, I was sucked in to the story, watching these two visibly pulse with electricity. It was very fun for me! Finally! A love story where the girl/guy doesn't immediately fall in love and forget everything else in the world just because their animalistic urges spoke UnGuarded, I will say, has potential. The plot is intriguing, the drama is thick and runs through the entire novel, and the writing is well done. I also very much enjoyed the chemistry between Luke and Selene; when it was the two of them, I was sucked in to the story, watching these two visibly pulse with electricity. It was very fun for me! Finally! A love story where the girl/guy doesn't immediately fall in love and forget everything else in the world just because their animalistic urges spoke up... How long have I been looking for this? And even when Selene had a flashback of a moment with Cole, it was adorable and easy to see they were in love. However. The main character frustrates me beyond belief. As she is an angel, her one care and priority should be Caitlyn, her charge-- this isn't just my opinion, it is in every story with an angel in it I have read, and even some lore --and all Selene cares about is Cole. Now, maybe if you'd met Cole before you hit the half-way mark of the book, or if their was a book before UnGuarded where you saw Selene having to make that decision to not become an archangel, to stay with Cole, then I might be able to deal with her easier. But honestly! She mentions several times how she is willing to die for Cole, because he's worth it, but when the same idea is offered to save her charge's life, she isn't sure. This made me blink and wander off a few times, just because I needed a break from Selene's strangeness. I love angel stories, so I... wasn't thrilled with this change. Though, I will say, I did like how God wasn't a major WHAP in the jaw for this book. Obviously the matter was mentioned; we are talking angels after all (even though Selene didn't seem like an angel to me and more like a teenage girl, but), but there wasn't a big attempt to rub everything religious in your face. Personally I can't stand that crap, and I'm very glad it wasn't here. I recieved this book as a gift to review on my blog. Boy am I a happy happy girl. Ashley Robertson is supreme awesomeness folks. No lie. Now to the book. Unlike Kami I have a thing for angels. This however is different then all the other angel books I have read. Selene is a guardian angel. Not a nephilim. Not a big bad fallen angel. Etc. Etc. She is truly an angel. I found that very refreshing and new and great. The writing was top of the line. I know there are people out in reading land that hat I recieved this book as a gift to review on my blog. Boy am I a happy happy girl. Ashley Robertson is supreme awesomeness folks. No lie. Now to the book. The writing was top of the line. I know there are people out in reading land that hate typos and sloppy errors. Well you will be happy to know that I didn't see any such thing here. I was pulled into this story and cheering for a certain male vampire (NOT COLE). I won't say anything more about that. No spoilers from me. The MC Selene comes off as being a bit selfish at times. Upon reflection that is because she is supposed to be an angel and she lets her human like feelings guide her. She often knows what she should be doing as an angel but follows her heart (a very human thing) instead. Wow. I spent a lot of the book upset with her. But toward the end of the book 'I got it'. Break through. Eureka! To sum it up I was invested in the story and the characters. If that isn't a hallmark of a good read then I don't know what is. I did get confused a couple of times in the book. I had to re read sections to make sure I was understanding things correctly. That could be due to the late night or because sometimes the characters would hop from place to place. I can't say for sure. I look forward to reading more from Ashley in the future. I have two requests for her as a writer...well three. 1- write a book about Luke. I want him to have a happy ending. 2- umm Zombies please. 3-Don't stop writing. I can't see what you come up with next. Off to read Crimson Groves (her first novel). Having enjoyed a previous work by Ashley Robertson, I was keen to see what she would come up with this time and I must say that the end result is a fast-paced tale of action and suspense. Selene is a very sympathetic characters and someone the reader can really get behind. I also liked the supporting cast who were all well realised. This book launches you into the action straight away and that fast pace remains right through, keeping you turning the pages, eager for more. The story idea was well co Having enjoyed a previous work by Ashley Robertson, I was keen to see what she would come up with this time and I must say that the end result is a fast-paced tale of action and suspense. The story idea was well conceived and presented and the characters were very likeable and memorable. For me only one thing let this book down (hence four stars not five) and that is the fact that I really would have liked more back story on Selene and Cole. There were some flashbacks to their time together before the events of the book, but I was looking for some more justification as to how they came to be a couple and why their bond is so strong. But even without that additional back-story, this is still a fun, entertaining read that will please the usual Urban Fantasy/PNR crowds - well worth checking out! How many chances is a guardian angel given before they fall from grace? For guardian angel Selene she is extremely close to finding out. Before meeting her vampire boyfriend, Cole, Selene was on the verge of becoming an archangel, but after her forbidden relationship was discovered Selene was stripped of some of her angelic abilities. While she still has enough guardian abilities to watch over her human charge, Caitlyn, Selene knows that loving Cole comes with a risk – she could become a fallen a How many chances is a guardian angel given before they fall from grace? For guardian angel Selene she is extremely close to finding out. Before meeting her vampire boyfriend, Cole, Selene was on the verge of becoming an archangel, but after her forbidden relationship was discovered Selene was stripped of some of her angelic abilities. While she still has enough guardian abilities to watch over her human charge, Caitlyn, Selene knows that loving Cole comes with a risk – she could become a fallen angel. Balancing her life as a guardian angel and her life with Cole has not been easy, but somehow Selene has managed – until now. When Cole is kidnapped Selene's world crumbles. How can she guard Caitlyn and rescue Cole at the same time? What ever choice Selene makes will result in devastating and life-changing consequences. Selene is the only one that can save Cole, but doing so will mean leaving Caitlyn unguarded, and with dark forces surrounding Cailtlyn, Selene has an impossible choice to make. Selene will need the help of both light and dark forces if she has any chance of rescuing Cole and keeping Caitlyn protected. Is it Selene's destiny to remain a guardian angel, or is she destined to fall? I loved the angel and demon mythology that featured throughout the pages of UnGuarded. It was intriguing and mysterious, and created the basis for a story that was full of unpredictable twists and turns which kept me engrossed from beginning to end. From the very first page the reader is immersed in main character Selene's world – a world which is at times intense and dangerous. Selene is different to the other angels. While most angels guard their charges from afar – always silent, always invisible – Selene watches over Caitlyn in human form. This is what connects Selene to humanity more than the other angels. While guardian angels are encouraged to love, they are not meant to fall in love, and for Selene falling in love with a vampire is probably the worst thing she could ever do – second only to leaving a charge unguarded. When Cole is kidnapped Selene believes that it is her fault. She needs to rescue him, but how can she leave her human charge? Selene loves her human charge, Caitlyn, and wants to protect her, but how can she not try to rescue Cole, the man she loves? Selene thinks that she can outsmart the demons that are surrounding Caitlyn – that she can rescue Cole and keep Caitlyn safe at the same time. When things don't go as Selene hoped or planned everything begins to unravel and Selene is the only one who can fix it – but at what price? It would be very easy to judge Selene. How could she even consider leaving her charge? After all she is a guardian angel, but she is also deeply in love. How can she not attempt to rescue Cole? It is easy to understand Selene's motivations. Through a series of flashbacks the reader is introduced to Selene and Cole's relationship. It is evident that they care and love each other very deeply, and it is this love that motivates Selene to rescue Cole. I thought it was very clever of author Ashley Robertson to write the flashback scenes, as it allows the reader an insight into Selene and Cole's life together. When another male vampire, Luke, is introduced in to the novel, as a potential love interest, it was very difficult for me to decide who I wanted Selene to end up with. Luke helps Selene in her quest to save Cole, and it is clear that he has feelings for her. As the novel continues Selene begins to develop feelings for Luke, but she doesn't know the reason behind it. Does she genuinely have feelings for Luke, or is there another reason for her growing feelings? Even though Cole is kidnapped he has a huge presence throughout the novel because of the flashbacks. The reader is exposed to Cole's personality, his love for Selene, his past, and his life as a vampire through the flashbacks. Cole is not pushed into the background. I love novels that keep me guessing and UnGuarded did just that. Sometimes I found myself wondering if those claiming to be good could actually be trusted. There was never a dull moment. With creative angel and demon mythology and an intriguing storyline, Ashley Robertson has written a novel full of suspense, romance, action and mystery that fans of angel and demon stories are sure to devour. *Thank you to Ashley Robertson for providing me with a copy of UnGuarded to review. Review originally posted at Treasured Tales for Young Adults. As soon as you delve into UnGuarded you are launched into action right off the bat, which I enjoyed, and it keeps with that same pace throughout the whole book. It is filled with angels, demons, vampires and a few immortals. Good versus evil is what this book is all about. What would you do for the love of your life? Would you risk one person for another? Would you risk your life for that of a person you care about? Those are the questions Selene finds herself facing. Selene is an angel guardian, whose main priority is to protect and watch over her charge, Caitlyn Harris. Caitlyn is Selene’s responsibility, to watch over and keep safe from demons. Selene was on her way to becoming an archangel, who are the most supreme beings to exist. Every angel strives to become one. Selene was close, but then she fell in love with Cole, a vampire. Angels are not supposed to be with vampires, but Selene loves Cole and that’s all that matters. She has given up being an archangel to be with Cole and some of her powers were stripped, but being punished still will not keep them apart. Cole ends up being kidnapped by demons and taken to Charon, a realm that has been over taken by demons. Selene has a hard choice to make, to leave her charge, Caitlyn, behind unguarded and without protection, which could leave her open for attack by demons. While Selene is gone and Caitlyn is unguarded, something horrible happens to her, and her future is uncertain. So again Selene finds herself trying to fix what happened to Caitlyn, and she will do absolutely anything to help her charge. Selene goes to Raphael, an archangel and her mentor for help, but there is nothing that can be done. Caitlyn’s future is marked in stone, with only two outcomes, and they are not ones that Selene feels she can live with. Follow Selene on her journey to see how it turns out. Will she triumph…or fail? I have not read any previous books of Ashley Robertson’s before UnGuarded, and I’m popping my hand for not having before this. She is a great writer and takes her readers into a world that she describes so well and leaves nothing out. You could actually picture yourself being there. I have not read a book like this one before, one that is filled with angels, demons, vampires, fallen angels and some immortals. I’m so glad that I chose this book to read and do a review for, it has opened my reading horizon. I loathe books that have misspelled words, mistakes, and do not have a great flow and happily UnGuarded is not one of those books. She writes so well and I did not find one misspelled word in the whole book, nor did I find myself drifting off into space. Throughout this book you will meet so many different characters, and they are so very likeable. It is full of action, tension, drama and love. You have good versus evil, and evil actually joining forces with the good to help out. The situations Selene finds herself in could be applied to everyday life, if you take out the paranormal aspect. I will definitely check out more books by Ashley Robertson. Okay - first things first. I think we should all take a minute and enjoy the GORGEOUS that is the Unguarded Book Cover. Did ya get a good look?! I mean really, is it not awesome!? Now that the moment is over, lets get back down to business! I was lucky enough to receive this book for a blog tour I signed up for. & now, after reading it, I must say that I made a pretty good decision to jump on this blog tour! Seriously, aside from the amazing cover, this book is like a paradise for lovers of fictional awesomeness. Demons, witches, vampires -- OH MY! While I haven't read too many books involving angels, Selene just kind of.. spoke to me. Why? This certain angel has a slight problem. She's pretty much in love with a vampire. (Dude. SOLD!) Selene has to be one of the toughest, most loyal heroines I have read about in awhile. Seriously, she defines Alpha Female. - I want to be just like her when I grow up! - I will point out that she does have a slight authority and rule following issue. Then again, who doesn't!? I'm telling you, I completely relate to this chick! Even though her love of Cole is forbidden and can be the very thing that stops her from becoming an archangel, when she finds out he has been captured, she's face with one tough decision. As an angel, her sole job is to watch over her charge, and by leaving to go after Cole - she is leaving her charge open for any and all harm to come to her with no one their to help her. So does she go after him, or stay with Caitlyn - her charge? This story flowed almost effortlessly for me. I honestly didn't come across anything I thought odd, or weird or just non fitting. The only thing I will say I wish there was more of was the story of HOW Selene and Cole came together. With this book I found myself eager to get to the end to see what happened, what didn't happened, and if I was right or wrong about things. Another thing I loved about this book is you could just TELL Ashley did her research before she wrote this book. All the questions that spawned in my mind while reading this, were answered at one point or another, which shows me she knew exactly what she was talking about! I love nothing more than a book that has some consistency in it! A gripping tale of forbidden love and sacrifice! For a guardian angel, there is no higher status than becoming an archangel. Just when Selene was about to reach that honor, she meets the handsome vampire Cole and falls in love, ruining her chances of every being an archangel. Selene has resigned her place as an archangel and is content looking after her charge Caitlyn, while spending time with Cole. When Selene learns her boyfriend Cole has been kidnapped, her world is torn upside down as she str A gripping tale of forbidden love and sacrifice! For a guardian angel, there is no higher status than becoming an archangel. Just when Selene was about to reach that honor, she meets the handsome vampire Cole and falls in love, ruining her chances of every being an archangel. Selene has resigned her place as an archangel and is content looking after her charge Caitlyn, while spending time with Cole. When Selene learns her boyfriend Cole has been kidnapped, her world is torn upside down as she struggles between her duty and her heart. To make matters worse, she meets an unlikely ally that is willing to help her find Cole but who stirs up feelings in Selene that are sure to cause this angel fall from grace. UnGuarded kicks off with an intriguing premise of angels, demons and vampires all tied into a story of forbidden love. While I thoroughly enjoyed this book, I had a few bones to pick with our angel heroine Selene. We're introduced to her romance with Cole from the very start through her thoughts and emotions, but I had a hard time really believing her undying devotion to him and connection, most likely because there was little interaction between their characters up until halfway through the story. Her connection with Luke was stronger for me and part of me wanted her to forget about her "true love" and give into him (I know...I know...she loves Cole). Selene is a tortured heroine who as an angel is torn between protecting her charge and following her heart, I get that, but as a guardian angel I feel her priority was often Cole and not her charge Caitlyn, which I found a little disheartening. All that being said, I guess any heroine that stirs up all these emotions in me is worthy of a second chance, I just expected her character to be a little stronger when it came to her duty. The fast paced plot and a creative new paranormal world of good and evil Ms. Robertson has written is entertaining and thought provoking. Although set in a paranormal world, the characters are faced with dilemmas we can all identify with. An unexpected love triangle and forbidden romance play a key role in UnGuarded, the story lacks the steamy romance expected but there's a delicious chemistry between Selene and Luke that make up for the lack of bedroom action. I'll be keeping my eyes opened for a sequel and can officially say I'm on TEAM LUKE! Unguarded, I will say, has potential. The plot is intriguing, the drama is thick and runs through the entire novel, and the writing is well done. The chemistry between Luke and Selene was electric, and pulsed right off the page, easily drawing me into the book. Finally! A love story where the girl and/or the guy doesn't immediately fall in love and forget everything else in the world, besides the other member of the relationship! How many times have I whined about that, guys? Seriously. That being said, the other side of the love triangle miffed me a little. I kind of feel like I missed the first book in this series. Cole and Selene were already together when UnGuarded starts, but you don't see them interact until about...oh, 50% through. But by then, the reader (me, at least) has already seen Selene and Luke semi-flirting and teasing each other, and you see Luke really cares for Selene, and that Selene is confused about her feelings, but as soon as Cole is back in the picture she suddenly doesn't care anymore. Though, I will say, I'm very glad that "God" wasn't a giant WHAP in the jaw for this book. A lot of the angel books I've read mention God so much, and personally, I don't like it. I don't like talking about it and I don't like reading about it, so I'm really glad it wasn't so "GodGodGodGodGod" in this. The matter was obviously mentioned--we are talking angels, here--but Robertson didn't rub it our faces and I was relieved by that. UnGuarded was a book so fantastically different from any other that I've read. Seriously. I am floored by how much originality this book contains. Who ever heard of coming at a love story, half-way through? I certainly haven't. Who would've thought that it'd work?! OHMYGOODESNESS, does it work! From the moment I read the first page of UnGuarded I was in it. There was no stopping me. Not my kids. Not my husband. Nada. I couldn't wait to get "just one more page" (YEAH RIGHT!) in before I had to put UnGuarded was a book so fantastically different from any other that I've read. Seriously. I am floored by how much originality this book contains. From the moment I read the first page of UnGuarded I was in it. There was no stopping me. Not my kids. Not my husband. Nada. I couldn't wait to get "just one more page" (YEAH RIGHT!) in before I had to put it down. Selene is so extremely awesome. The poor thing seemed to be in a state of perpetual guilt-ridden angst, but she always had the best of intentions. Well, most of the time. SOME of her actions, I may have considered, uh, "questionable", but wouldn't you act questionably for YOUR love, too? Even if you WERE a guardian angel? What is most important, is that Selene was willing to give up ANYTHING for her vampire love, Cole. When we start the story, Cole is already knee-deep in trouble. He got kidnapped. Now, Selene has to save him. Trouble is, she's got a job to do. A very important job. But, well, she doesn't let that stop her. This is what I mean, though. At first, all we get are little flashbacks of Selene and Cole--as Cole is otherise "engaged". But, it doesn't matter! The flashbacks are enough to make the reader squirm in anticipation for a reunion between these two. From the very beginning Ms. Robertson is in no way lacking at her job of getting the reader to understand Selene's love for Cole or even Cole's love for Selene. Although, saving Cole doesn't come easy. Selene DOES get help, however, in the form of ANOTHER (HOT) vampire, Luke. Seriously, what does this girl need with ANOTHER hot vampire?! Lucky, girl. SO, there is a bit of a triangle. A bit of some of that misunderstanding-who-do-I-love business. Let me be clear, however. UnGuarded was never boring. It was never cliché. All I could think of was how in the WORLD would everything get turned around? How would Selene POSSIBLY get her happy ending. Well, you need to read it to figure that out. It is So. Beyond. Worth it. This book was provided free from the author in exchange for honest literary review. The opinions voiced here are solely my own and given freely. Selene was sent to eath to be a guardian angel. Her first responsibly is always her charge Caitlyn, who also happens to be her dear friend. Against the archangel's warning she has been spending way too much time in human form bonding th her charge. These moments have also allowed Selene to-do the unthinkable...fall in love with Cole who is a vampire. Angels of light and never supposed to associate with creatures from the darkness...let alone love them. Source: Review copy was given to random jendsmit by the author in exchange for an honest review. I really liked this story idea. Guardian Angel falls in love with a Vampire… good loves bad… forbidden love… yep it is all of that – everything we love, right?! I’ve read a lot of stories about love that is forbidden and the aftermath of those actions – this one follows the same arc but the initial love is something I have not seen before. I really like it! I did enjoy the story but I didn’t really feel connected to Selene the MC. I really didn’t like Cole much at all… which is odd right? I usually totally love the BF of the MC, but this time I actually connected and felt invested in Luke. I usually flip flop back and forth between the BFs, but this time I didn’t – I was Team Luke from page 1, or whenever he enters, but you know what I mean, don’t sass me! LOL! I would love to read more about what happens to Luke & Selene… and Cole if I have to. I would love to see what comes next for them all. Bottom line – I think you might like this book – check it out (links are below for you)! Demons, Angels, and Vampires, OH MY! This is the second book by Ashley Robertson that I have read, and I have to say that I really enjoy her writing style a lot. I had a really tough time putting it down. The story is about an angel named Selene. She is assigned to a human to guard. All guardian angels are given a human that they watch and similarly there is a specific demon that is normally assigned to that human as well. As long as the human doesn't do terrible deeds, they will join the light Demons, Angels, and Vampires, OH MY! This is the second book by Ashley Robertson that I have read, and I have to say that I really enjoy her writing style a lot. I had a really tough time putting it down. The story is about an angel named Selene. She is assigned to a human to guard. All guardian angels are given a human that they watch and similarly there is a specific demon that is normally assigned to that human as well. As long as the human doesn't do terrible deeds, they will join the light and their angels will fight all the more harder for them. As they do evil things and give in to the darkness, the demons trailing them gain more control. In these situations, the angels are sometimes pulled and reassigned. This is something that plays a key part in the story. What makes Selene so different and special from other angels is that she is in love. Angels are capable of endless love which is supposed to be and normally is for their charge. Selene loves her charge, but she also loves a vampire. Vampires are considered part of the dark and are expected not to have the capacity to love. Selene learns otherwise and is faced with losing the love of her life forever or losing her charge. It's similar to choosing between your child and your spouse. Which is the right decision. No one really knows. She has to make deals with demons and risks falling from heaven. Will she be able to save both her charge and her love? Will she fall from Grace in the process? What happens when an angel shares blood with a vampire? These are all questions you can learn the answers to by reading this fantastic story. This book was so exciting! I was sucked it from the very beginning. I loved getting to see all the flashbacks and memories. It really helped me understand the story more, and make it seem more real to me. I felt like I was actually there. Sometimes though I felt a little confused and lost. Also some parts kind of dragged on for me. Selene made a lot of mistakes but she did everything she could to fix them and save the people she loves. She was such a strong female lead character. She went through literally hell and back. Luke was so loyal to Selene and would do anything for her. I was rooting for him the whole time. I never really liked Cole at all. I just didn’t feel it with him like I felt it with Luke. Raphael was kind towards Selene and I liked him as an Archangel. It was a little hard for me to picture him like that though. He seemed brotherly to me and more like a mentor. I liked Darius more than Raphael. He was better at teaching Selene and a little more understanding. Overall I think the characters were well developed but I couldn’t connect with them on the level I wanted to. This book was really good and I would recomend this book to all of my friends. The ending was good and sweet but a little dissapointing. The ending was a little open for me. Also there were a lot of unanswered questions that I had and really want answers to. Overall this book was an exciting and so full of action and adventure. I couldn’t put it down. I would love to read more books by this author in the future. Angels and fallen angels are a hot topic in the young adult genre right now. What I really liked about Unguarded was how the author blended other paranormal beings into the mix. Instead of being a book about fallen angels being in love with a human, she brings demons and vampires along for the ride. The main character, Selene, who just happens to be an angel, falls in love with Cole - a vampire. I liked how the normal storyline was spiced up with the added supernatural creatures - I felt that it Angels and fallen angels are a hot topic in the young adult genre right now. What I really liked about Unguarded was how the author blended other paranormal beings into the mix. Instead of being a book about fallen angels being in love with a human, she brings demons and vampires along for the ride. The main character, Selene, who just happens to be an angel, falls in love with Cole - a vampire. I liked how the normal storyline was spiced up with the added supernatural creatures - I felt that it gave it a refreshing twist on the concept and made it stand out from the rest. The storyline is an interesting one and I really enjoyed reading it. The thought of a snarky and somewhat pissy angel was fun. I really liked Selene's character and it was easy to identify with her. The other characters in the story were quite likeable as well, which I thought made the story that much better. I loved the forbidden romance between Selene and Cole. They had to face a ton of hardships in their relationship, which is something that most couples have to do as well. It was hard not to root for them. The narrative was very well written and had a great flow to it - which made this a really fast read for me. The only real negative thing (if you could call it that) was that I didn't want the book to end. It was a page-turner that had me hooked from the beginning and I'm really looking forward to reading more of Ashley's books. Highly recommended for paranormal YA fans - especially those who love angels and vampires! Selene is an angel destined to become an archangel, who oversees and protects her human charge, Caitlyn. Selene has fallen in love with a vampire named Cole. Angels and vamps are not allowed to be together, but that doesn't stop these two. With so much at stake we learn the ramifications of falling for a forbidden love. Selene is at risk within her kind and may never become an archangel. Cole is captured by a demon and now Selene may put everyone at risk including her human Caitlyn, by teaming u Selene is an angel destined to become an archangel, who oversees and protects her human charge, Caitlyn. Selene has fallen in love with a vampire named Cole. Angels and vamps are not allowed to be together, but that doesn't stop these two. With so much at stake we learn the ramifications of falling for a forbidden love. Selene is at risk within her kind and may never become an archangel. Cole is captured by a demon and now Selene may put everyone at risk including her human Caitlyn, by teaming up with another vampire, Luke to try and save everyone. Luke is a character who seems to be a better fit with Selene and a nice love triangle would of been great to see, although you do see jealousy spring up between these guys. Unguarded was a well written, action-induced read with only a few speed bumps along the way. The only gripe I really have and I'm sure by now the author is in the mist of writing it, would be a prequel to this book. A little backstory of exactly how Cole and Selene meet and fall in love would really be a great addition to this story. I also felt at times that Selene would go to great lengths for her love Cole, but the one she is supposed to go to great lengths for, and protect, Caitlyn, is basically left to her own defense. Now, remember Selene is an angel who only should be doing good and helping her human, not exactly the case here when she is trying to do her best to save Cole, the most. All in all though, I will say the story was a different take on the paranormal aspect and I did enjoy reading this quick-paced read. Ashley Robertson has created another fantastic world with a collection of every creature you could imagine. Vampires, angels, demons, sirens, and shadow sliders all take center stage in Unguarded. Selene is an angel with a dilemma; she’s in love with a vampire. Her ranking as an angel has been demoted after the revealing of her love affair, and she has been warned to stay away from any dark ones. When her lover, Cole, is suddenly taken hostage, there are few places to turn. The angel is willing Ashley Robertson has created another fantastic world with a collection of every creature you could imagine. Vampires, angels, demons, sirens, and shadow sliders all take center stage in Unguarded. Selene is an angel with a dilemma; she’s in love with a vampire. Her ranking as an angel has been demoted after the revealing of her love affair, and she has been warned to stay away from any dark ones. When her lover, Cole, is suddenly taken hostage, there are few places to turn. The angel is willing to do anything to get Cole back - even things that could cause her to become fallen. There are a lot of twists and turns throughout Unguarded as the main character Selene orbs from world to world in search of help. She bumps into a vampire named Luke, but he seems to hinder her more than anything. After finding out his true intent, and the damage he may have created between Selene and Cole, things get interesting. Traveling from one world to another, Selene makes pacts with the unholy, fights unseen forces, and struggles to find her love. But nothing will prepare her for the transformation of herself through the search. Battles with demons, inner and manifested, come to the forefront in Ms. Robertson’s books. Since they are told from first person POV, they’re all very interesting to me. I love a good inner struggle. I received this book from a drawing on a blog; that included one of the authors stops in her book tour, and I was very excited to read it. What initially drew me to this book was the beautiful cover, but after reading the blurb I was very excited. An angel falling in love with a vampire? I've never heard of such a thing. In the beginning my heart absolutely ached for Selene and her missing lover. But then I found myself getting frustrated with her, because she was ignoring an angels most importa I received this book from a drawing on a blog; that included one of the authors stops in her book tour, and I was very excited to read it. What initially drew me to this book was the beautiful cover, but after reading the blurb I was very excited. An angel falling in love with a vampire? I've never heard of such a thing. In the beginning my heart absolutely ached for Selene and her missing lover. But then I found myself getting frustrated with her, because she was ignoring an angels most important responsibility. Her charge. I loved the relationship that Selene had with Caitlyn, and the way that the story progressed. The downfall in this book for me was that I didn't really get much of a feel for Selene and her relationship with Cole except for little snippits of flashbacks. What made him so much more important than her charge? What about him made her so willing to fall or give up being an archangel? NOTE: I received a complimentary copy of this book from PromotionalBookTours. This was a fun story for me to read. I love reading all types of vampire books and some with angles. So this was a real treat for me to read something new and different then I have ever read before. I really liked Selene a lot in the book, being pulled in so many directions and having to make tuff choices. This book keeps you going from the start from Selene being sent to earth to being Caitlyn’s guardian angel to helping her love Cole. Cole ends up being kidnapped by demons and taken to Charon, This was a fun story for me to read. I love reading all types of vampire books and some with angles. So this was a real treat for me to read something new and different then I have ever read before. I really liked Selene a lot in the book, being pulled in so many directions and having to make tuff choices. This book keeps you going from the start from Selene being sent to earth to being Caitlyn’s guardian angel to helping her love Cole. While Selene has left to help Cole and leaves Caitlyn alone, Caitlyn has only two out comes and Selene is having a hard time with what Caitlyn’s future is marked in stone as. What will happen to Selene? Is she going to become a fallen angle? Will Caitlyn’s Future change? What happens to Cole? Guardian angel Selene did the one thing Angels shouldn't do... fall in love with a vampire. Her vampire lover, Cole has been taken and Selene is eager to find him. But to do this it would leave her human charge Caitlyn helpless to any and all attacks. But she has to make some choice. Either lose Cole forever or lose Caitlyn and any hope of becoming an archangel. Angel, Vampires & Demons, oh my! This was a great read. I loved Cole and Selene's story -- and it was made even more interesting wit Guardian angel Selene did the one thing Angels shouldn't do... fall in love with a vampire. Her vampire lover, Cole has been taken and Selene is eager to find him. But to do this it would leave her human charge Caitlyn helpless to any and all attacks. But she has to make some choice. Either lose Cole forever or lose Caitlyn and any hope of becoming an archangel.